Now Micro is honored to be recognized by CRN’s on its annual Solution Provider (SP500) list. Now Micro made the 2014 ranked list of the Channel’s Top Technology Integrators. 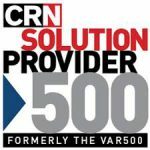 CRN’s prestigious Solution Provider 500 list also included some of the most recognized names in the technology industry, including IBM, HP, and Dell. Formerly known at the “VAR 500,” the list ranks the top revenue-generating technology integrators in the U.S. and Canada whose forward-thinking approach to the channel has helped them evolve and thrive in today’s cloud and services-drive IT era. Revenue size was determined by the amount of annual products and services sold over the course of 2013. The list spans eight categories from hardware and software sales, to managed IT services. The SP500 selection panel seeks to recognize companies that are building out practices around the data center and virtualization while offering software integration and application development skills. Now Micro leaders are very pleased to be named as a top industry solution provider by CRN and The Channel Company. As a company, our success is tied directly to how well we help customers achieve their business goals and IT requirements. It’s an honor to be recognized for the investment Now Micro has made toward providing the best possible solutions for customers. As the technology industry continues to evolve, channel partners must continue to put their customers first, as they reach new technological heights. A sample of the 2014 SP500 list is featured in the June issue of CRN Magazine and is featured in the CRN Tech News app.